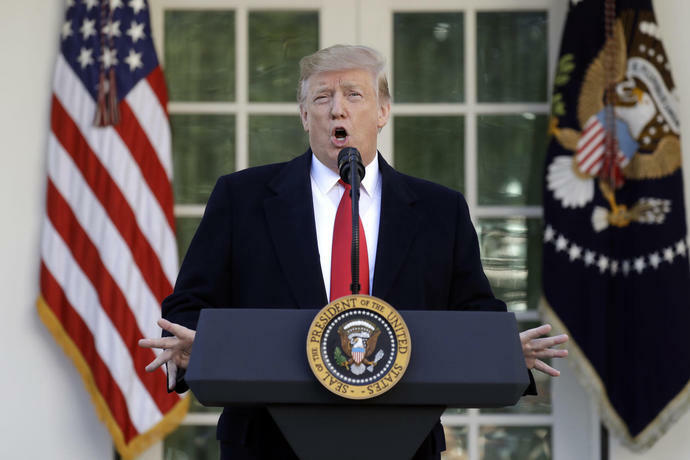 WASHINGTON (AP) - Submitting to mounting pressure and growing disruption, President Donald Trump agreed to a deal Friday to reopen the government for three weeks, backing down from his demand that Congress give him money for his border wall before federal agencies get back to work. The shutdown was ending as Democratic leaders had insisted it must - reopen the government first, then talk border security. "The president thought he could crack Democrats and he didn't and I hope it's a lesson for him," said the Senate Democratic leader, Chuck Schumer. House Speaker Nancy Pelosi said of her members: "Our unity is our power. And that is what maybe the president underestimated." Still, some thought Trump had to see the results of votes a day earlier -and understand that the proposal he offered before that could not advance- before he was willing to make a move. But by Thursday, he was coming around on a short term fix, said a person familiar with White House thinking who was not authorized to speak publicly. White House and congressional leaders hashed out the terms Friday, though many were not sure Trump would commit to the plan until the final moments. The breakthrough came as LaGuardia Airport in New York and Newark Liberty International Airport in New Jersey both experienced at least 90-minute delays in takeoffs Friday due to the shutdown. And the world's busiest airport - Hartsfield-Jackson Atlanta International Airport - was experiencing long security wait times, a warning sign the week before it expects 150,000 out-of-town visitors for the Super Bowl.